In this article we will talk about the various industrial and non-industrial uses of Java programming language. Java Programming language is Object Oriented and Platform independent programming language, which makes it an ideal programming language for developing cross platform applications. Java was developed to simplify the development of applications based on OOPs principal. In this article we are introducing you with the Java programming language and also talk about the use of Java. Java technology is a high-level programming and a platform independent language. Java is designed to work in the distributed environment on the Internet. Java has a GUI features that provides you better "look and feel" over the C++ language, moreover it is easier to use than C++ and works on the concept of object-oriented programming model. Java enable us to play online games, video, audio, chat with people around the world, Banking Application, view 3D image and Shopping Cart. Java find its extensive use in the intranet applications and other e-business solutions that are the grassroots of corporate computing. Java , regarded as the most well described and planned language to develop an applications for the Web. Java is a well known technology which allows you for software designed and written only once for an "virtual machine" to run on a different computers, supports various Operating System like Windows PCs, Macintoshes, and Unix computers. On the web aspect, Java is popular on web servers, used by many of the largest interactive websites. Java is used to create standalone applications which may run on a single computer or in distributed network. It is also be used to create a small application program based on applet, which is further used for Web page. Applets make easy and possible to interact with the Web page. Java has advantages over other languages and environments that make it suitable for just about any programming task. Java is simple, easy to design , easy to write, and therefore easy to compile, debug, and learn than any other programming languages. 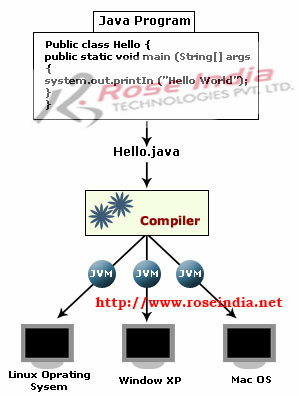 Java is object-oriented, that is used to build modular programs and reusable code in other application. Java is platform-independent and flexible in nature. The most significant feature of Java is to run a program easily from one computer system to another. Java works on distributed environment. It is designed to work on distributed computing , Any network programs in Java is same as sending and receiving data to and from a file. Java is secure. The Java language, compiler, interpreter and runtime environment are securable . Java is robust. Robust means reliability. Java emphasis on checking for possible errors, as Java compilers are able to detect many error problem in program during the execution of respective program code. Java supports multithreaded. Multithreaded is the path of execution for a program to perform several tasks simultaneously within a program. The java come with the concept of Multithreaded Program. In other languages, operating system-specific procedures have to be called in order to work on multithreading. JDK Tools: The JDK tools provide compiling, Interpreter, running, monitoring, debugging, and documenting your applications. The main tools used are the Javac compiler, the java launcher, and the javadoc documentation tool. Application Programming Interface (API): The API provides the core functionality of the Java programming language. It gives a wide collection of useful classes, which is further used in your own applications. It provides basic objects and interface to networking and security, to XML generation and database access, and much more. Deployment Technologies: The JDK software provides two type of deployment technology such as the Java Web Start software and Java Plug-In software for deploying your applications to end users. Graphical User Interface Toolkits: The Swing and Java 2D toolkits provide us the feature of Graphical User Interfaces (GUIs). Integrated Libraries: Integrated with various libraries such as the Java IDL API, JDBC API, Java Naming and Directory Interface TM ("J.N.D.I.") API, Java RMI, and Java Remote Method Invocation over Internet Inter-ORB Protocol Technology (Java RMI-IIOP Technology) enable database to access and changes of remote objects. Easy to Start: Since Java programming language is completely based on object-oriented language, it's easy very simple and easy to learn, especially for programmers already known with C or C++. Easy to write code: As compared to program metrics (class counts, method counts, and so on) tell us that a program written in the Java programming language can be four times smaller as compare to the same program written in C++. Write better code: The Java programming language encourages good coding practices, and manages automatic garbage collection which helps you avoid memory leaks. Based on the concept of object orientation, its Java Beans component architecture, and wide-range, easily extendible, flexibility and API can reuse existing, tested code and introduce fewer bugs. Develop programs and Time Safer: The Java programming language is easier and simpler than C++, as such, manages your development time upto twice as fast when writing in it. The programs will also require fewer lines of code. Platform Independencies: The program keep portable and platform independent by avoiding the use of libraries written in other languages. Write Once and Used in any Java Platform : Any Source code of Program are written in the Java programming language, that is compiled into machine-independent byte codes and run consistently on any platform of java. Distribute software makes work easy : Using Java Web Start software, users will be able to launch own applications with a single click on mouse. An automatic version check initially weather users are always up to date with the latest version of your software. If an update is available for it, the Java Web Start software will automatically update their installation. Platform is cross-combination of hardware or software environment in which a program runs. We are already known with the most popular platform like Microsoft Windows, Linux, Solaris OS, and Macintoshes OS. The Java platform differs from other platforms, that is only software-only platform which runs on other hardware-based platforms. The Java Virtual Machine is the root for the Java platform and is integrated into various hardware-based platforms. The API is a vast collection of various software components that provide you many useful functionality to the application. It is grouped into logical collection of related classes and interfaces; these logical collection are known as packages. The API and Java Virtual Machine insulate the program from hardware. Java work on platform-independent environment, the Java platform is bit slower than native code. However, new changes in compiler and virtual machine brings performance close to that of native code without posing any threatening to portability security. All source code is written in text files (Notepad Editor) save with the .java extension in the Java programming language. The source files are compiled into .class files by the java compiler. A .class file contains byte codes ? the machine language of the Java Virtual Machine (JVM). The java launcher tool runs your application with an instance of the Java Virtual Machine. JVM works on different Operating System . The .class files(bytecode) capable of running on various Operating System. There are some virtual machines, such as the Java Hotspots virtual machine that boost up your application performance at runtime . This include various tasks such as Efficiency of Programme and recompiling (to native code) which is frequently used sections of code. Java JVM, the same application is capable to run on multiple platforms.